If you were designing a light aircraft from a truly blank sheet, what propulsion system would you choose? One that needs no air for its operation, giving full power at every altitude; one that is inherently quiet and produces no exhaust emissions; one that is simple to operate and reliable because of its few moving parts; and one that is perfectly scalable allowing one large engine or several smaller engines? Or would you go for a powerplant that was inefficient, noisy, powered by fuel of often-fatal inflammability, an emitter of poisonous gases (sometimes into the cabin, with fatal results), inefficient at high altitudes, and inherently complex? On every measure except range, electric propulsion emerges as a superior way to propel a small general aviation aircraft—and recent developments are closing the gap on electric power’s longstanding drawbacks. One possible solution is to have both engines, like a hybrid car. In July 2016, Airbus took a new hybrid 1.2 version of its E-fan electric aircraft to the EAA Oshkosh AirVenture gathering in Wisconsin. A year earlier, in July 2015, the original E-fan 1.1 single-seat electric aircraft made the second electric-powered crossing of the English Channel (the aviation giant was upstaged by an amateur enthusiast, Hugues Duwal, although his aircraft was air-launched, rather than taking off under its own power). The E-Fan1.2 demonstrator takes off and lands on electrical power, drastically reducing the noise level at low altitudes. NASA is taking a different approach. Engineer Mark Moore is Principal Investigator on the Scalable Convergent Electric Propulsion Technology Operations Research (SCEPTOR) project at the NASA Langley Research Centre in Virginia, US. The NASA approach is based on the concept of distributed electric propulsion. This takes advantage of what Moore calls the scalability of electric motors. A dozen small motors will provide the same thrust as one big one, but distributing them across the aircraft’s wingspan brings transformational aerodynamic benefits. ‘I believe that distributed electric propulsion is one of the biggest technology changes in aviation since the invention of the turbine engine,’ Moore told the Smithsonian Institution’s Air and Space magazine. ‘Whatever size those electric motors are … you get high efficiency, high reliability and incredible compactness,’ he said. ‘Whether it’s at one horsepower, 10 horsepower, 100 horsepower or 1000 horsepower, those characteristics stay true. It doesn’t care how big or small the motors are. That’s not the case for existing internal combustion or turbine engines,’ Moore said in a lecture at the Langley Research Centre. He has also pointed out online that electric motors weigh about six times less per horsepower than a reciprocating engine. The theoretical efficiency of an electric motor at 92 per cent is more than three times that of a piston engine at 28 per cent. This goes some way towards compensating for the energy density of the best current batteries, which is 50 times worse than that of avgas. As part of the project, NASA’s Armstrong (formerly Dryden) Research Centre in California is working with two small start-up aviation technology companies: Empirical Systems Aerospace (ESAero) and Joby Aviation. Last year it began low-speed testing of a 9.5 m wing fitted with 18 electric motors. Rather than build an unmanned proof of concept aircraft NASA engineers chose to test a full-size wing on top of a truck, so that success could lead quickly to development of a manned version. That aircraft will be known as Maxwell, after the Scottish physicist who, along with Michael Faraday, developed the theory of electromagnetism that paved the way for innovations ranging from electric power to fibre-optics. Maxwell will be NASA’s return to the ‘X-plane’ series of experimental aircraft, reviving a lineage that began with the first supersonic aircraft, the X-1 of 1947. It will be a modified Tecnam P2006T twin-engine piston aircraft. 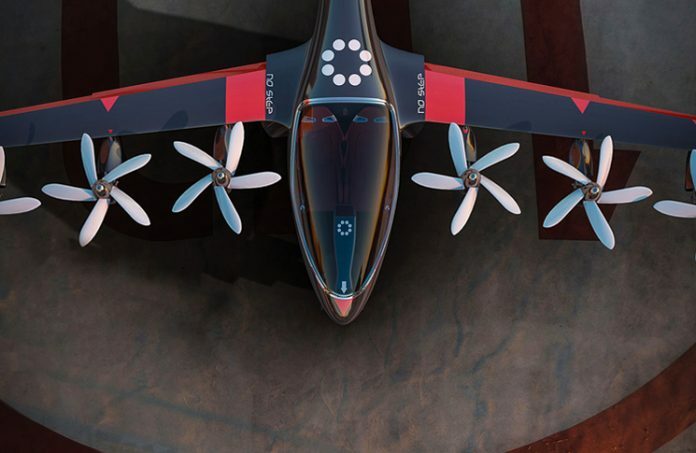 Instead of two Rotax piston engines, it will have 14 electric motors—12 for take-off and two for cruise flight. They will be mounted on a long, narrow ‘cruise-sized’ wing, resembling that of a high-performance glider. Such a wing allows efficient high speed cruise flight, but in conventional applications has a high take-off speed—the X-57 will lower its take-off speed by having the 12 electric motors blow air over the wing, giving it a higher airspeed than the rest of the aircraft. At a safe airspeed margin over stall, soon after take-off, these engines will stop, fold their propellers into their nacelles and hand over propulsion duties to the two wingtip motors, which will extract further efficiency by turning in the opposite direction to the wingtip vortices. Two important safety issues with the thin-chord blown wing are what happens in the case of total power loss, and what happens if one of the outboard-mounted cruise engines stops. ‘In the case of a total power loss our stall speed goes from 55 knots to about 87 knots,’ Moore told Flight Safety Australia. ‘Since it’s a multi-engine, the 61 knot stall speed doesn’t apply, but it’s quite important to be able to ensure we can still achieve a 600 m (2000ft) landing field length no matter what. ‘However, a total power loss would be an extremely rare event where many failures would need to occur simultaneously. Not only is each propeller isolated to achieve redundancy with its own motor and controller, but we have multiple power buses and wiring paths, along with multiple battery modules. So the entire power and energy system is redundant. There are three different ways of sensing an asymmetric thrust condition on the cruise motors, Moore says. ‘We also have designed the motor to be internally redundant, with two separate windings and two controllers for each motor, so if one motor controller fails the other can still provide half power (which is controllable even with full thrust from the motor on the opposite side). ‘If the propeller fails, or the bearings were to seize, then we would immediately detect this and simply shut off the motor on the other side (i.e. turn both cruise motors off). As the aircraft decreases speed to less than 110 knots we can spin up all the inboard high-lift props (which are simple fixed pitch folding props) in order to generate sufficient thrust for approach and landing. The benefit of distributed propulsion is efficiency, in energy, and speed. ‘General aviation aircraft are only aerodynamically efficient at low speeds because the wing is oversized for 61 knot stall, 2000 ft field lengths,’ Moore told the E2 Fliegen conference in Germany. ‘Who cares how about flying around at 30 to 70 knots as it doesn’t have much use for transportation? NASA’s priority is to make electric flight relevant for high-speed aviation solutions,’ he says. Moore’s E2 Fliegen presentation discusses how distributed electric propulsion offers the most dramatic gains in general aviation aircraft, as the aerodynamic and engine efficiency of larger turbine and jet aircraft are higher. Moore says current battery technology would offer a distributed electric propulsion aircraft a 200 nm range. He has said online that adding a small range-extending motor-generator, as on the E-Fan or the General Motors Volt car would double range to 400 nm. While 200 nm is a relatively short range, Moore has said the low operating costs and high degree of automated systems made possible by electric multi-engine aircraft could recast the role of general aviation. ‘The marriage of a digital propulsion system with autonomy is where the doors open up for being able to do completely new missions, with completely new types of aircraft.’ Moore says ‘Whether it’s through a small unmanned aerial vehicle delivering a package, or an electrically powered commuter aircraft that’s cheaper, more reliable and easier to land in an environment close to homes and businesses, on-demand mobility has the potential to change society for the better’. have you had a look at what Pipistrel are doing with their Alpha Electric?